Jaled Abdelrahim's interview with Steve Elkins for Yorokobu can be read in English below. YOROKOBU: Why and when did you start looking for music made from ‘noises’? ELKINS: I grew up in California about ten minutes away from Disneyland. When I was 19, I took a college course called "Sociology of the Magic Kingdom." The class took place secretly inside Disneyland, so that we could observe firsthand how a culture like Disney can manipulate all of your bodily senses over the course of a day to engineer what your experience of the world is like. One of the main ways they do this is through sound. Having been a musician for most of my life, I was already acutely aware of how the "music industry" does this sort of thing, by patrolling the borders of what cultural life can be imagined to be. But I began to research how some of Disney's techniques were later adopted by urban developers in American cities to tune people like a radio into playing a prescribed role in "society." They began to use sound to influence the boundaries of how we think and live. This class led me to think more seriously about how this is done and and how it is kept invisible to people. There is a very simple visual technique used in Disneyland that reflects how they use sound: Disneyland was built structurally so that you literally cannot see outside of it, while never having your attention drawn to this fact. Most visitors never notice for a moment that they cannot see any reminders of a world outside the park, not a single mountain or skyscraper. I took this as a metaphor for how culture works in general. Culture and tradition are extremely powerful horizon lines. In many ways, they create the limits of our perception and our language. I began to wonder how this happens. And what our relationship to sound can tell us about our relationship to the limits of our perception. How do people develop borders within themselves that make them hear one thing as "music" and another as "noise?" The air is basically an enormous library of information in the form of sound. Why do our brains put a frame around certain frequencies and call them "music" but discard others as noise? In Jean-Luc Godard's film "Le Gai Savoir," Jean-Pierre Léaud says "We only hear when we are a part of what is said to us." "The Reach Of Resonance" is a film that asks what leads one person to hear music in barbed wire fences, and another to hear music in the social struggles that led to the construction of those fences, and yet another to hear music in the complex ecology surrounding them all. How do these things begin to speak to us in a way that they become a part of the narrative of our lives? What makes our empathy deepen so that something we once ignored suddenly has a voice that we listen to? I wanted to consider if our relationship to noise is the story of how we develop empathy. YOROKOBU: Why did you chose the people who are in your film? Do their stories have a relationship to each other? ELKINS: I chose people whose music focuses on very different details of their surroundings, ranging from weather patterns in Alaska to the legislative response to the AIDS crisis in California, which resonate in surprising ways when brought into close proximity to each other. The idea was to create a dense web of associations between people talking about very different things. As if they were having a conversation with each other, even though they weren't. YOROKOBU: Is there a structure to the film? ELKINS: There is, but it is not conventional or obvious. I wanted to create a labyrinth that viewers have to work their own way out of, just as the brain struggles to find narrative in the chaos of noise. This allows viewers to go through the same process as the artists. YOROKOBU: Why are you so interested in sounds? Is there a specific reason? ELKINS: I've been a musician for most of my life. I started drumming when I was four years old. Music enabled me to communicate something of my experience of life that words couldn't. So sound has always been associated in my mind with a struggle for clearer communication and deeper connection. Also, it seems that sight is the dominant sense we use in our culture to construct our sense of self. It is far less obvious how we do this through sound. So I wanted to take a closer look at that. YOROKOBU: Do you think everything has its own music? Or that the things your characters do are just symbolic ways to create musical scores? ELKINS: At one point in The Reach Of Resonance, composer John Luther Adams says: "Quantum physics has taught us that the universe is more like music than matter. Everything that we regard as physical, everything that we regard as permanent is, at its core, in motion, is vibrating, is singing. What is music but audible physics?" In that sense, one could argue that everything is made of the same physical characteristics of music. Even though it fascinates me to consider whether music may reflect some deeper strata of what makes the world what it is, I'm really more interested in considering the life experiences that lead someone to hear something as music. Because that gives us a chance to really learn about each other. I find that more valuable and interesting than any metaphysical picture of the world that we might construct. 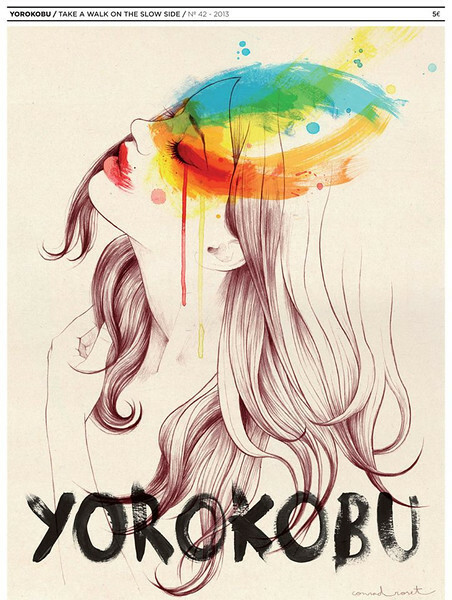 YOROKOBU: If you had to say what is the sound of the world is, what would you say? ELKINS: On a train from Nové Zámky to Prague in 2009, I met a man who wondered what it would sound like if the topographical contours of the earth were grooves in a vinyl record, and constructed a device that's like a virtual turntable needle playing the surface of the Earth as a record. It's now in a museum somewhere in Europe, playing at the speed of the Earth's rotation, and you can go hear what that sounds like. People working in the field of cymatics have found ways to show how certain tones create and maintain forms and shapes found in nature. Astronomers in Antarctica are using the South Pole Telescope to actually see the internal acoustic harmonics of the supposed Big Bang for the first time, and determine the fundamental tone of the explosion that led to the cosmos we live in. Jacques Attali has explored the idea that the world is best understood through hearing rather than seeing, because changes in social relations are audible in music long before they are visibly manifest in society or statistics. Even though these examples don't really answer your question, and I don't have a personal answer for you, they at least suggest some interesting ways people I've met are approaching it. YOROKOBU: If you had to explain the world or the meaning of life to someone, would you use words or sounds? ELKINS: Human beings would have gotten rid of either language or music long ago if we didn't need both to communicate to each other. I'd hate to limit the articulation of the world to human language, even if it can be very beautiful, because that's not the only way the world articulates itself to us in the first place. YOROKOBU: What does "The Reach of Resonance" mean? ELKINS: In English, the words "Reach" and "Resonance" each have double meanings that evoke the spirit of the film for me. "Resonance" suggests both the literal physical nature of music, but also its inner mystery: the inexplicable bridge it can build between people. Likewise, "reach" implies "distance," but also a sense of "touch." YOROKOBU: How far has your film reached across the globe, and where were some of the most meaningful screenings? ELKINS: So far there have been more than 50 screenings in about 15 countries, including screenings at the National Gallery of Art in Washington DC, CERN's Large Hadron Collider (Switzerland), Harvard University, the Tel Aviv Museum of Art, the Beirut International Film Festival, the Santander Cultural Center in Brazil, Grauman's Egyptian in Hollywood, the Karlovy Vary International Film Festival (Czech Republic), the Boston Museum of Fine Arts, and the MUTEK Festival of Digital Creativity and Electronic Music in Mexico City, where you and I met. For me, one of the most meaningful screenings was at Shapir College in Sderot, Israel, one of the most heavily bombed cities in the world, on the border of the Gaza Strip. The film was screened there during a particularly heavy period of almost daily rocket attacks from Hamas and related groups in fall 2012.